THE DISASTER ARTIST is the story of a cult character called Tommy Wiseau and the cult film he accidentally made, called The Room. I'd not heard of or seen the former before James Franco championed their cause with this film. It turns out that Wiseau was and remains a deeply shady figure - no-one knows his age, origin, or where he got his money. As the film opens Wiseau (James Franco) is attending acting classes in San Francisco. He's rich, thickly accented, and delusional about his talent. Nonetheless, he takes up with his friend Greg Sestero (Dave Franco) and they move to LA to find work. Being talentless, and for Wiseau, also creepily weird, unsurprisingly no-one hires them. And there the story should've ended. Except that Wiseau is delusional and rich, so he decides to make his own movie! The wastefulness is extreme - he buys both film and digital cameras, builds sets unnecessarily, and starts work on a film that he truly believes is going to be great. Except that it's appalling, hampered in no small measure by his own awful script and acting. And this goes hand in hand with increasingly dictatorial and mean-tempered behaviour on set. Still, the juggernaut moves toward its opening night and when the audience laughs AT rather than WITH the film, Wiseau chooses to believe that he was making a comedy all along. He keeps the film in cinemas for two weeks on his own dime, hoping to qualify for the academy awards. Of course, it doesn't make money or get any awards, but sinks into obscurity until it gains a "so bad it's good" rep at midnight screenings. I had a good time watching THE DISASTER ARTIST until I didn't. By that I mean that Wiseau is a weird enough character, and James Franco's impression is so superb, that it's truly captivating. But about half way through the film, I realised that there was nothing else in this film for me. The painstaking recreation of seminal scenes in The Room didn't interest me. It's a bad film being made badly! 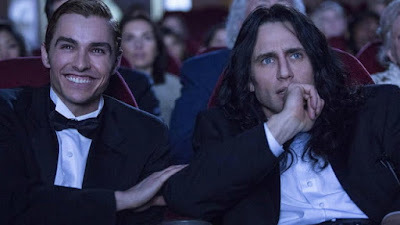 So the overall verdict is - THE DISASTER ARTIST is worth seeing for Franco's impression of Wiseau - but as it doesn't actually dig behind that persona - or give us anything but a cliched friends falling out narrative arc - it outstays its welcome. THE DISASTER ARTIST has a running time of 104 minutes and is rated R. It is rated 15 in the UK for strong language. The film played SXSW and Toronto 2017 and opened last year in Australia, Canada, the UK, Ireland, the USA, Philippines, UAE, Argentina, Netherlands, Norway, Iceland and Spain. It opens on Jan 4th in Portugal; on Jan 11th in Hong Kong; on Jan 12th in Finland and Romania; on Jan 19th in Mexico and Taiwan; on Jan 25th in Brazil and Greece; on Feb 1st in Germany and Denmark; on Feb 9th in Poland and Sweden and on March 7th in France.